Use the "Content File Manager" (a suite of admin screens provided with the addon) to automatically set filenames on your content records and then create all those files in bulk. 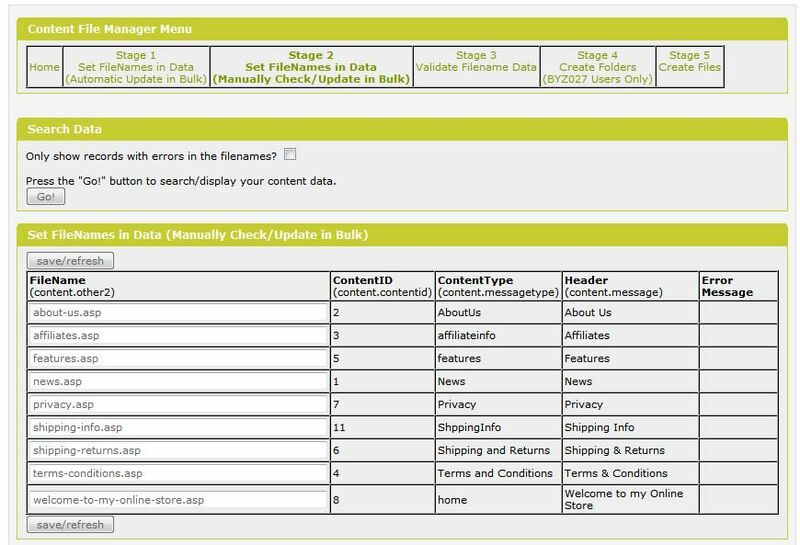 If you want to show a given content record inside an existing page/panel, then this will allow you to do so. You simply call the new function with the "type" as your argument, and it'll show the content record. There are various functions for this; one will show the entire record/format within your panel, and the other will just show the content's body (and there's another one for the title-only too). For VPCart V7 or above, you can call a given content record on your side panel via the Layout Manager as BYZ110 (this module) and BYZ162 (Extra Panel Elements, included within this module) let you do this easily without having to manually edit your header files, it can all be done via the Layout Manager. Redirection from your dynamic (shopcontent.asp) urls to the corresponding static (eg "about-us.asp") files is included within the module; you can configure it to do "301" redirects, "Canonical" header tags, or no redirection. 301 and canonical will allow search engines to not penalise duplicate urls and will keep your ranking. This module will also allow you to change your static urls (eg "aboutus.asp" to "about-us.asp") and the old static url will automatically redirect/canonical-tag in the same way when people land on the old static page. Using an existing column as your base (such as message, or messagetype) you can set all your content record filename values to an automatically-translated valid filename (eg turn "About Us" as a message (header) value to "about-us.asp" in your filename field) - This can be done in a single shot without editing the individual records. This also has a test-run facility so that you can see the old/new file status without updating the data. Using a multi-record screen (one row per content record), you can, if you want, edit all your filename values in one simple screen. 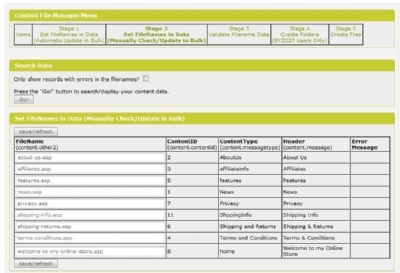 Displays a summary of any content records which have invalid (or duplicate) filename values. Only relevant if you have BYZ027 installed. This will go through your content filename data and create any missing folders on your server. Press a button to generate all your static content files in one go. This also has a test-run facility so that you can see the old/new file status without creating the new files. Please Note: You should never delete your old static files; you should instead just allow your system to do the kind of redirection specified within this module from old static files to corresponding new ones. 02 10-SEP-2006 Changed the breadcrumbs to use a variable (config option) column. 03 04-OCT-2006 Changed documentation/logic/config-options to cater for VP-ASP V5.5. 04 08-OCT-2006 Changed to avoid conflicts with some other BYZ Addons (feeds, and sitemap generators). 05 04-MAR-2007 Clarified installation/usage instructions. Changed shopfileio logic to use new variable include to cater for V6.5. 06 18-APR-2007 Changed to cater for a generic sqlserver bug: whenever referencing a sqlserver text column in a cursor it then blanks-out that value in the cursor; this software has now been changed to cater for that sqlserver bug. 07 02-JUL-2007 Changed to cater for multiple directories (BYZ027) so that users of BYZ027 can create content files in any directory. 08 30-OCT-2007 Upgraded BYZ038 (from V07 to V08). Changed dynamic header (title, keywords, meta-description) to be setup in a different/new config file (ie split-out from the main include) and changed corresponding configuration option. (changed xbyz_cms_filecreation_content_columnname default setting from other1 to other2 to avoid conflicts with keywords which normally use other1). Changed vpasp template and samples to define missing global variables to avoid errors when translating languages on the dynamic headers. 09 06-JUL-2008 Upgraded BYZ038 (from V08 to V09). Changed loggedin contents field to be processed/checked explicitly as a boolean value, taking into account different database types and definitions/values, so that contents which are not supposed to be shown for non-loggedin users arent shown unless theyre logged in. 10 07-AUG-2008 Added BYZ143/01 Module. Changed to cater for the new version of BYZ027 (BYZ027/07) for those who use the Multiple Directory Addon. If upgrading BYZ110 to V10 or later, and you use BYZ027, make sure you upgrade BYZ027 to V07 or later first. 11 16-JAN-2009 Upgraded BYZ038 (from V09 to V10). Upgraded BYZ143 (from V01 to V02). 12 30-MAR-2009 More changes to avoid conflicts with some other BYZ Addons (feeds, and sitemap generators). 13 10-JUN-2009 Enhanced to cater for SQLServer Bugs in some additional places (referencing text/ntext, ie memo fields within cursors). Changed dynamic tag derivation function to add a (commented-out) call to the generic content tag setup process if the site owner wants to use that instead of the dedicated BYZ110 tag logic. Changed breadcrumbs to default from message instead of messagetype. Split breadcrumbs display into separate config file/function and changed its class/html. 14 23-AUG-2009 Added includes to allow the standard [Add_randomproducts] template field to be usable/callable for generated static content files. 15 17-MAR-2010 Added a new suite of admin screens (Content File Manager) to allow quick/easy bulk-update of content file data and bulk-file-creation for content files. 16 09-APR-2010 Changed to be compatible with VPASP V7. Added automatic static content folder creation option to Content File Manager (this enhancement is only available for VPASP V7, and only relevant if youre using BYZ027). Upgraded BYZ143 (from V02 to V03). 17 23-APR-2010 Added new config option for static file creation to allow an option of either using the messagetype or the contentid for the argument/call. This is needed for when you have unsafe words (such as union or select inside your content.messagetype column). Also added breadcrumbs and impressions config options for static file creation. 18 30-MAY-2010 Changed to cater for SqlServer text/ntext bugs (where cursors get blanked out). Changed folder/file logic for calculating the urls and physical files etc. Added extra option to be able to display only the records with errors on the filenames in the edit-filenames screen. Added maximum number of records to display as parameters. Added folder creation stage for VPASP V6.5 or below (only relevant/usable if BYZ027 is installed). The create-file link has been taken out of the edit-content admin screen as the content file manager is now to be used instead of manually creating content files from the edit-content admin screen. Added redirection options (301, or canonical urls, or none) from non-static content files to static files. If upgrading from a previous version, please backup your original installation and then uninstall this module and re-install it again using the latest files/notes. 19 27-JUL-2010 Corrected the variable declaration file for the vpasp v6.5 and below file (was missing 2 variables and causing undefined variable errors). 20 12-OCT-2010 Changed the file manager screens to ignore hidden content records. 21 18-FEB-2011 Added extra redirection logic so that static urls can be changed, and the old static file will redirect (or use a canonical tag depending on your config options) to the corresponding new static url. Upgraded BYZ162 (from V01 to V02). 22 13-JUL-2011 Upgraded BYZ038 (from V12 to V13). Added new config option (xbyz_cms_admin_extra_where_clause) so that you can specify a where clause indicating which content records to use on the Content File Manager screens (for example you can use this to ignore the home page content record). 23 18-SEP-2011 Changed the function which checks the static file exists to use a more efficient method. Added an extra optional step on the installation notes explaining how to create an index on the filename column to help speed up the admin screens, and a new step for how to relabel the filename field on the edit-content screen, and an extra step to avoid the static url from being copied/set via the edit-content screen. Upgraded BYZ162 (from V03 to V04). Please Note: If upgrading from a previous version of BYZ110, you must make sure you are using V14 or above of BYZ038 before upgrading to BYZ110 V23 or above. 24 27-NOV-2011 Changed more functions to use the generic BYZ cursor opening/closing functions to help avoid cursors getting blanked-out with 8k/memo (text/ntext) bugs and to use less memory. Upgraded BYZ162 (from V04 to V05). 25 01-MAY-2015 Changed to use the new BYZ038 functions where appropriate. Split out some admin screen logic into separate files to allow for easier maintenance when dealing with vpasp version-specific differences. Upgraded BYZ038 (from V15 to V31). Upgraded BYZ036 (from V10 to V18). Upgraded BYZ143 (from V03 to V05). Upgraded BYZ162 (from V05 to V10). For a full list of effected files, see the history readme file that comes with this modules zip file.